Something In The Air right up to the announcement of The Maureens' new album was associated with that U.K. band with a mighty strange name, Thunderclap Newman. One of those singles that made a huge impression on the mind of a young child, for who everything was new and fresh at the time. It is not often that I am surprised by music in such a way. What I am capable of nearly 50 years later is hearing good music and appreciate that music in a way I appreciated all good music over the decades, whether old or new. This is the case ever since I encountered The Maureens for the first time when it did a trial run of what was to become its new album in 2015, 'Bang The Drum'. The rest is history on this blog, until today. The third album of the band is under review. In the past years three band members left and being replaced by only one bass player. This changed the dynamics in the band significantly. I could lament for a while here about the beautiful harmonies being lost, etc., etc., but there is no use crying over spilt milk. So let's rejoice like I am the cat lapping up said milk, as there is enough to enjoy on Something In The Air. 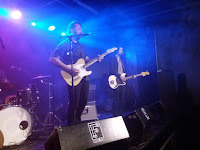 Yes, things have changed and I have voiced it in this post (http://wonomagazine.blogspot.com/2019/01/the-maureens-live-jvc-de-schuit-katwijk.html). This should suffice. Right at the very start of the album The Maureens shows it means business. A jingle-jangle Rickenbacker guitar opens '4AM' in a The Byrds like way. 54 Years op pop music come together in 3 minutes and 5 seconds. Something that started with 'Mr. Tambourine Man' in the version of The Byrds and will continue way past early 2019 with '4AM'. In search for the perfect pop song The Maureens is. In melody, in sounds, in vocal (harmonies). I'm not sure utter perfection exists, but if it does '4AM' comes very close to it. The "Ah-ah-ah"s are so beautiful. The jangly guitar melody so in place. Hendrik Jan de Wolff is able to write the best of pop songs and the band knows its way with them. Something In The Air is an album that belongs to an era long gone by. It is the sort of pop that has nothing to do with youngsters these day, although at times I am surprised what they know and like. For those in hip hop, urban, r&b and such have no use for Something In The Air. Ageing men like me who loved pop at its finest, will recognise this album for what it is: a high quality product from a fine band. Each harmony that could be found within a song is explored and put in its right place. The inventive guitar melodies played by Martijn Vink adorn each song. Creating melodies, dynamics and firm foundations where needed and if possible. The tight rhythm guitar allow for the adventures. One of the immediate ear catchers of The Maureens are the harmony vocals. Yes, it is not the same, but together with Wouter Zijlstra, De Wolff harmonies in a great way, assisted by drummer Stefan Broos to create three parts. Together they create a bitter sweet atmosphere where past and present come together, just like Sunday Sun was able to do. The beautiful memories of things past return in the title track while "driving down the long road", then for real, and now in the form of warm memories. The album cover is a part of it all. We see a four year old Hendrik Jan walking towards the family car high up in the mountains. 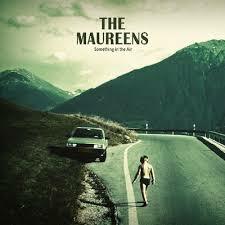 With its third album The Maureens consolidates its position as one the Netherlands' finest pop band. The sweetness, the bites, the light and the shade come by in the form of beautiful to great pop songs where the delight of playing and singing together wins out 110%. Something In The Air is more direct than its two predecessors, simply because the band has a far more elementary line up. The directness shows in a bare song like 'Trying To Reach You', before Martijn Vink's guitar goes all out in three great guitar solo's. Again another very fine song, with a totally different dynamic. Perhaps even a song I would not have expected from The Maureens yet a favourite on Something In The Air. Change is something a lot of people do not like. In fact a lot of people do not even like a new album by a favourite band (until it has become old). Change can also be for the better or just be change. Things change with time. For The Maureens it has worked out well. The band grabbed the circumstances by the lapels and turned them into good use. "Ah ah ah ah", like they can sing so beautifully together. With a Spanish record label, airplay in Spain and a summer tour that takes the band to Spain and a few other countries on the way, the sun is already shining for The Maureens on these dark, sultry, wintry days. Catch them in The Netherlands this spring when you can.